MS 25434, Martial d'Auvergne: La Dance des Femmes. This manuscript is probably older than the printed versions of the women's Danse Macabre. Like so many other of these ancient manuscripts it should rather be thought of an anthology and contains many different texts. The dance of the men runs from foil 18 until 35 verso, and then there are 7 other texts before the women start on foil 61 (picture to the right). In BNF 1186 from the year 1482 There are only 30 participants since the witch and the old woman are missing. BNF 1186 is also special in that the spinster appears early on in the dance right after the young woman, la damoiselle. The two next manuscripts, among these MS 25434, which we are studying here, shows a development. The spinster, la vieille damoiselle, has taken the position, which she will hold from now on and the sequence has been expanded with an old woman and a witch, la sorciere. This means that in this manuscript there are two verses with the heading "La vielle", namely the original old woman, who in future editions is called "la femme aux potences" (the woman with crutches) and the new old woman, la vielle. There are also two girls, because the virgin maiden, La pucelle vierge, is called La fille, while the girl normally called La fille is called La fillete. Other changed titles are the midwife, La garde dacouchees, who is called La garde, the amorous lady, La femme amoureuse, who is called La femme commune and the hospitable woman, La femme dacueil, who is only called La femme, which isn't very helpful in a dance with 32 women. 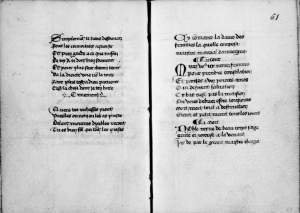 Another interesting feature of this manuscript is that the heading states that the poem was composed by master Martial d'Auvergne: »composa maistre marcial dauuergne« (picture to the right). Ann Tukey in fodnote 3 pages 13-14 reviews the known works by d'Auvergne and concludes that the Danse Macabre of women fits in well with the themes that d'Auvergne wrote about. On the other hand one must remember that "composing" could mean many things: In the 1486 Miroer Salutaire, Guy Marchant ended the first half of the book with a colophon stating: »nouvellement ainsi composee et imprime par guyot marchant«. The 30 men had been dancing on the wall of the churchyard since 1424, so in this case "composee" could at most refer to an expansion of the participants. The dance of the woman was transcribed by Luise Götz in 1934. I have compared Götz' text with the manuscript and corrected a few insignificant errors (the most important error is that Götz had left out a "que" in the third line of Death to the citizeness. Another small error is in the darling wife, where Götz transcribes the last line as »Femme en ces faulx meurt a regret«. Miot Frochot believes it should say "saulx", and I agree. This is also what it says in all other sources. The witch's 3rd line is missing. Don't forget to read the men's dance in the same manuscript or a comparison o Manuscript 25434 and the printed books. Miroer Salutaire from 1486 which Guy Marchant claimed to have "composed".